Healthy, properly aligned teeth serve as the foundation for a confident, attractive smile. If your teeth are crowded, crooked, or unevenly spaced, you may find that you feel self-conscious around others, particularly at work or in social situations. You may have thought about orthodontic treatment to straighten your teeth in the past, but the notion of wearing metal braces simply doesn’t appeal to you. Fortunately, there is an alternative: Invisalign clear aligners from Dr. David M. Weinman in Westfield, NJ. Unlike traditional metal braces, Invisalign aligners are made of a clear and durable acrylic material that is smooth and comfortable against your gums and lips. While metal brackets and wires may cause discomfort and irritation of the soft tissues in your mouth, Invisalign aligners are virtually unnoticeable and they can be removed for daily oral hygiene and eating. 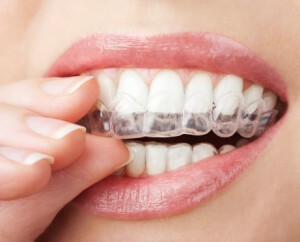 Many Invisalign patients are adults who would like straighter teeth but also want to maintain a polished and professional appearance – something that is often difficult to achieve with conspicuous metal braces. Invisalign is also a great option for many teens; it is particularly helpful for adolescents who play sports or a musical instrument. Whereas regular braces can interfere with these activities, Invisalign can easily be worn comfortably and discreetly on the field, on the court, and in the band hall. Dr. Weinman has actually used Invisalign himself, so he understands everything there is to experience when it comes to this innovative orthodontic treatment. He and his caring team are always here to answer any questions you may have about your treatment, offering their knowledge and guidance as you watch your new smile emerge. Dr. Weinman is your premier Westfield, NJ Invisalign provider, providing his expertise, training, and personal experience at every step of your treatment until your smile is flawless. If you’d like to find out if Invisalign is the right choice for you, give us a call today to schedule your consultation. We genuinely look forward to welcoming you to our practice and helping you achieve the healthier, more beautiful smile you’ve always wanted. Our team proudly serves families from throughout Westfield, Mountainside, Scotch Plains, Cranford, Fanwood, and beyond.